American vs. British scones: Why the sweet American kind are a delicious pastry in their own right. Juliana Jiménez Jaramillo for Slate. Sure, Starbucks’ glazed behemoths are nothing to write home about. But there is something to be said for the Americanized scone—not as a clownish imitation of a British staple, but as a delicious pastry in its own right. As any stickler will tell you, an authentic English or Scottish scone—pronounced as though there were no e at the end—is much like an American baking-powder biscuit. It might contain oats in addition to flour, and it might come studded with currants, but it won’t be too sweet, and it certainly won’t bear any type of sugary topping. The purpose of a British scone is to be a lofty, feathery vehicle for jam and clotted cream and, above all, an accompaniment to tea. 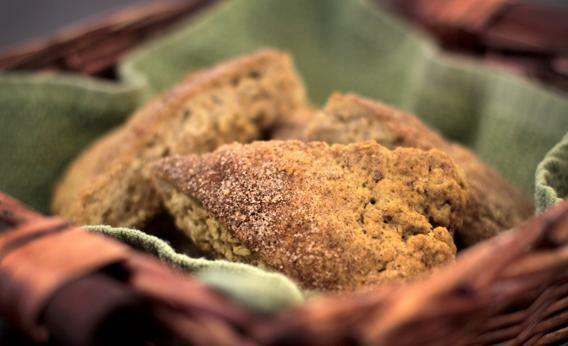 American scones are different, and that difference can be a beautiful thing. An American scone does not need jam or clotted cream—or any filling, really: It’s a self-contained snack (though an extra smear of butter never killed anyone … at least not right away). It’s pleasantly sweet, and it has wiggle room for all sorts of additions: spices, fruits, nuts, even chocolate. A wise baker will not overload an American scone with extra goodies, nor will she shy away from them. Freed of cultural baggage and expectations of authenticity, the American scone is flexible in shape and content. Like Dylan going electric, this casting off of tradition may upset some people. But such flexibility is key to the deliciousness of a great American scone. The recipe below makes careful use of that flexibility. (It’s based on an excellent Pillsbury recipe erroneously titled “Scottish Scones.”) These scones are sweet, but not cloying; they’re coated with a little cinnamon sugar instead of a sticky glaze. They’re not gargantuan, since enormous scones have a tendency to be dense and doughy; you can eat a couple of these without feeling overstuffed. They’re rich, thanks to butter and cream, but enhancing them with a handful of chopped pecans or chocolate chips would not be overdoing it. The cream and oats are a nod to their British forerunners, but the cinnamon, nutmeg, vanilla, and (two kinds of) sugar make it clear that these are something different. If what you want is a bready foundation for jam, you’re better off with buttermilk biscuits, anyway. 1. Heat the oven to 375°F and grease a baking sheet. Combine the flour, oats, brown sugar, baking powder, salt, nutmeg, and 1 teaspoon of the cinnamon in a large bowl. Add 7 tablespoons of the butter and blend with a pastry cutter or your fingers until the mixture resembles coarse crumbs. Add the cream and vanilla and stir just until combined, then transfer the dough to a floured surface and knead 5 or 6 times. 2. Transfer the dough to the baking sheet, and roll or press it into an 8-inch circle. Melt the remaining 1 tablespoon butter in a small saucepan over medium-low heat (or in a microwave-safe bowl in the microwave). Brush the dough with it. Combine the remaining ¼ teaspoon cinnamon with the sugar and sprinkle it over the dough. Cut the dough into 8 equal wedges and separate them just enough that they no longer touch. 3. Bake the scones until golden brown, 25 to 30 minutes. Serve warm or at room temperature.